Nutritional transition, urbanization, and physical inactivity are primary factors responsible for the worldwide epidemic of overweight/obesity (OW/OB). However, these factors fail to explain the epidemic of OW/OB in developing countries and in recent-migrants to developed countries. Among these, OW/OB is associated with short/stunted stature and coexists with undernutrition at much higher rates than is statistically expected. Changes in metabolic pathways toward reduced fat oxidation and increased metabolism of carbohydrate may explain, in part, this phenomenon. Also, intergenerational consequences of malnutrition and poor health of the others may lead to impaired phenotypes in their offspring. We propose a novel methodology to assess the history of early life malnutrition by assessing the sitting height ratio of the mothers. The degree of »short leggedness« reflects undernutrition when the mother was an infant/child. 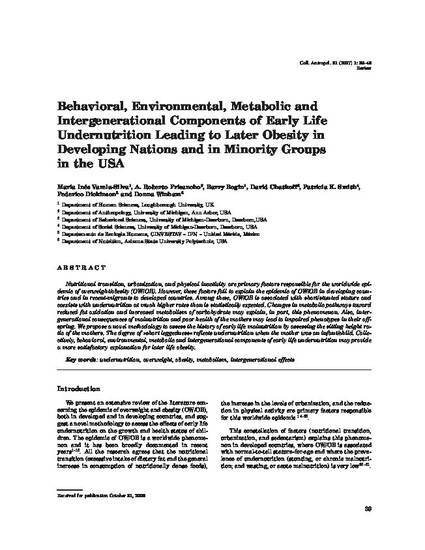 Collectively, behavioral, environmental, metabolic and intergenerational components of early life undernutrition may provide a more satisfactory explanation for later life obesity.